Annie the Broadway Musical Has A Four-Legged Star: Meet Sandy's Trainer! Bill Berloni, theatrical animal trainer extraordinaire, and Sunny the shelter dog, now starring on Broadway! Who doesn't love that adorable redheaded girl, Annie, who sings her way into our hearts and out of an orphanage...and just happens to have an equally adorable and faithful canine companion named Sandy? Well, it turns out that the Pedigree Brand loves Annie, too, and has teamed up with the show to shine a spotlight worthy of Broadway on shelter dogs. Pedigree will donate $2 for every ticket sold to the show, up to a whopping $1million, to its Pedigree Foundation, which in turn, will go directly to help shelter dogs find loving homes. This partnership has already raised half a million dollars! Since the first production of Annie in 1977, the role of Sandy has always been played by a real life shelter dog, and this latest version of the play, which opened last fall, is no exception. But the interesting back story is that Bill Berloni, the Tony Award winning theatrical animal trainer has been with Annie since the beginning, too. We had the pleasure of chatting with Berloni last week as he was on his way to the theater from his farm in Connecticut, and we've got lots of behind-the-scenes stories to tell-so many in fact, that we'll be divvying up the tales into several posts. 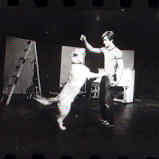 When the first Broadway production of Annie was getting started in 1976, Berloni was a 20 year old actor and apprentice at the Goodspeed Opera House who was offered a deal he couldn't refuse: find and train a dog for the original production of Annie in exchange for a chance to act professionally. Although Berloni had grown up on a farm, all of his family dogs had been purebreds, and he'd never been to a shelter. But because he was short on funds, that's where he went looking for the dog who would soon become the first "Sandy". Berloni said "he was profoundly moved by what he saw" and has been rescuing shelter dogs ever since. When people have asked him why he has only used shelter dogs for the thousands of canine Broadway appearances he's coached, Berloni answers "Why not? Why borrow someone else's pet when you can save a life?" And he soon realized that the publicity generated on Broadway could be "used to educate people about animals in shelters." A match made in heaven, we say! Berloni acknowledges the difficulty in training dogs for live performances rather than, say, movies or television, where there are plenty of retakes and the use of creative camera angles. But Berloni says that he creates a "working relationship with his dogs, as opposed to the alpha-dominant relationship" that many dog trainers use. We think (and we're extrapolating, here) that this partnership that Berloni creates with his dogs stems from what he told us about his childhood: he was an only child living on a farm, but says he was never lonely- the animals were his friends. As for rewards, he uses whatever that particular dog really likes, which could be food, toys or affection, "Whatever it takes [for the dog] to lie down when he waves his hand, but ultimately it becomes affection," he says. Sunny, who stars as Sandy in this production of Annie is more interested in food than his understudy, Casey, who spits out her treats-"she just wants approval." Whatever magic Berloni weaves as an animal trainer, he clearly keeps his dogs happy and healthy-the original Sandy never missed a performance in an over 7 year run-that's just about 2700 shows! And his dogs tend to rest, play and eventually retire to his farm, where 22 dogs, 4 cats and an assortment of horses, llamas and a miniature donkey live happily. 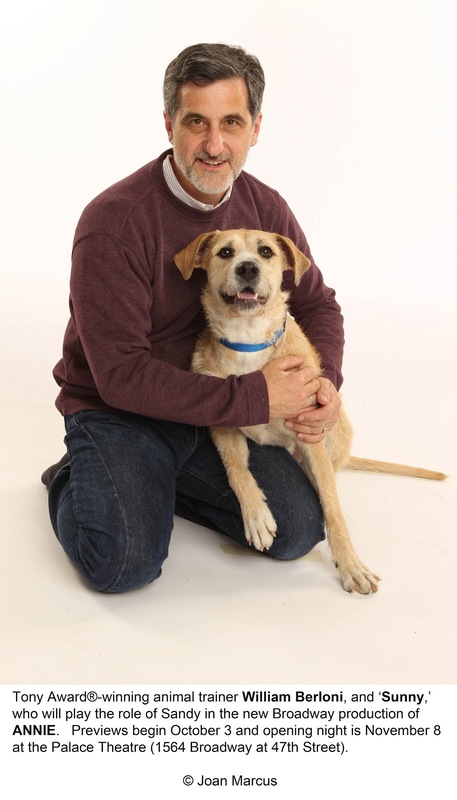 In his off-Broadway time, Berloni is an animal behavior consultant to the Humane Society of New York. In our next post, we'll reveal some of Berloni's backstage tricks of the trade, so to speak, including how he "trains" the human stars of the Annie cast. Stay tuned! In the meantime, enjoy this three part short-film, sponsored by Pedigree and directed by Berloni, called Annie's Search for Sandy.